The verdict: Butchering is so stinkin easy. – This is definitely a craft. And unlike with needlepoint, if you don’t do this well the animal suffers. Do yourself a favor and find someone to guide you through the process in real life the first time you attempt it. I have a lot more respect for butchers now. – Butchering goes much, much easier for both you and the chicken if you have sharp knives. – It’s better to kill chickens on a sunny day that’s not too cold or too hot, preferably fall after the flies have settled down. – Taking the life of a living creature hasn’t gotten easier for me a dozen birds in, but there is a huge satisfaction in knowing that I can put meat on my family’s table without a grocery store. 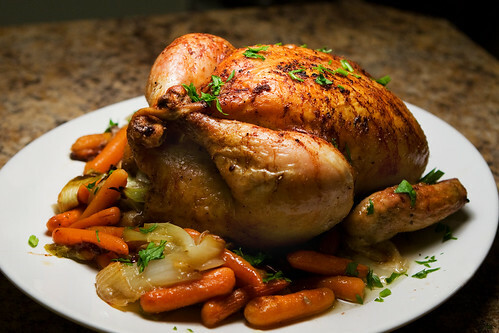 Organic, pastured chicken is delicious... and cheap if you do it at home. Many thanks to Nicole for this great series! Thanks for letting me participate! I should probably give some props to my friend Anna, my partner in this adventure. I’ve really learned a lot from her.